Line a rimmed baking sheet with paper towels and place a rack on top; set aside. In a medium bowl, whisk together the flour, cornmeal, baking powder, salt and sugar. Measure out the buttermilk in a liquid measuring cup, and add to that the water and oil; blend well. Add eggs and mix well; combine with dry ingredients. 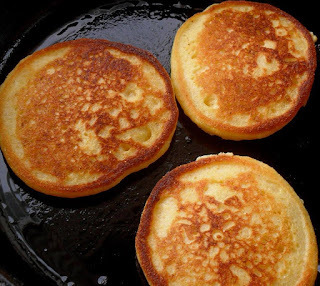 Heat oil and butter in a cast iron skillet over medium to medium high and drop batter by about 1/8 cup measures into the hot skillet to form small medallions. Fry until brown and crisp, turn and brown the other side. Remove and let drain on rack. Serve immediately with warm syrup for breakfast or as a snack, or dip ’em in a mess o’ greens to sop up that pot likker (juice from the greens)! Variation: When corn is at peak and in-season, add about 1 cup of corn cut and scraped off the cob. You’ll need about 1 large ear of corn. Can also make this into a pan hoecake. Add only enough buttermilk to make a stiff batter. You may not need the additional water. Pour into a screaming hot, well greased 8-inch cast iron skillet over medium high heat. Reduce heat and let brown underneath about 10 – 15 minutes. Run a metal egg turner underneath and turn to brown the other side. Can also bake in a well preheated 425 degree F oven for about 15 to 20 minutes (no turning needed). Tip: If you spray the measuring cup with a bit of non-stick spray before scooping, the batter will slip right out. If you don’t happen to have that 1/8 cup measure, just do about 2 tablespoons of batter in one pile and push it around to form a medallion.